The Marriage took place at St. Mary’s Church, Rushden, on Saturday, by special licence, of Miss Sarah Holliday, second daughter of Mr. and Mrs. T. Holliday, of 16 Oswald-road, Rushden, to Sergt. David Jones (7th R.W.F. ), only son of Mr. and Mrs. David Jones, of 5 Poplar-terrace, Machynllyth. The Rev. P. E. Robson officiated. The bride, who was given away by her father, was charmingly gowned in white voile, with white hat trimmed with a white ostrich feather. Her jewellery consisted of a gold bracelet, the gift of the bridegroom. One bridesmaid was in attendanceMiss Emily Holliday (sister of the bride), who was tastefully costumed in navy blue, with white voile blouse and grey tagel hat trimmed with roses. Subsequent to the ceremony, a reception was held at the bride’s home, and later in the day Sergt. and Mrs. Jones left for Cambridge for the honeymoon, the bride wearing for travelling a fawn costume trimmed with military braid. A number of useful wedding gifts were received. Sergt. 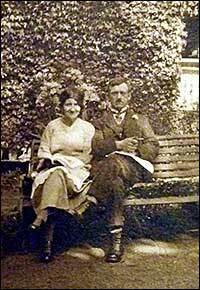 Jones, when billeted in Rushden, was the guest of Mr. and Mrs. Spriggs, of 3 Harborough-road, Rushden. He fought in the Gallipoli campaign and we understand, lost a forefinger. Although he had received his discharge from his Majesty’s forces, he has rejoined for the duration of the war. In 1911 Sarah was working as a stillroom-maid for Samuel Whitbread, and she was one of 12 girls employed by him, and there were 3 male servants.